The terms "window glaze" and "caulk" are often used interchangeably. They are, however, two very different products with specific applications. Substituting caulk for glazing compound can cause unsatisfactory results and is not recommended. Glazing compound is used as a seal between window glass and the frame. With proper application, it will last indefinitely. Glazing compound is purchased in a can and has the consistency of putty. It is applied with a putty knife and can be up to 1 inch wide. Caulk describes a variety of products designed to fill in gaps around foundations, windows, doors, vents and other openings that can let in winter cold air and summer heat. It prevents water damage around tubs, toilets, faucets and other plumbing fixtures. It is applied in cracks that are ¼ inch or smaller. The most common types of caulk are silicone, latex, and acrylic.They come in a variety of types and strengths. 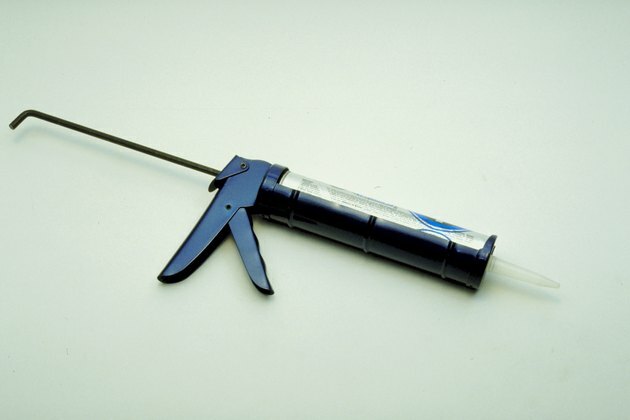 Caulking compound can be purchased in a variety of tube sizes for small projects. For larger applications, it comes in a disposable cartridge that is dispensed by placing it in a spring-loaded caulking gun. Both glazing and caulking compounds require a clean, smooth surface for a good adherence. After a 20-year career in fashion design and interior decorating, Sena Hairgrove has become licensed in the real estate and insurance industries and has received numerous awards for her production. She has written, edited and published local Chamber of Commerce magazines and numerous real estate newsletters and brochures. How Long Does Caulk Need to Dry?